Are you a dealer of IT products? If you sell hardware and software products and are looking to add a high profitable product to your offerings, please listen up ! We offer reselling opportunity for our unique and fast moving software product ICM. If you are already an existing software reseller, hardware dealer, running any business with good customer base or looking for new business opportunity we invite you to partner with us to deal with a high remunerative and easy selling software product. ICM offers attractive return on investment which extent up to 300%. It’s a great opportunity for any dealer to cover up investment at lightning speed. It is highly possible to sell the product to existing clients as well as the new clients of different product line. No further investment is required to obtain ICM dealership. ICM makes easy salable as the product satisfies the demand of various segments like Religious organizations and establishments, Cast community units and groups, Family associations, Festivals committees, Cultural and sports events conducting bodies, NGO’s, Sports clubs, Cultural clubs, Recreations clubs, Health clubs, community service societies, Residential associations, Flat owners societies, Professional associations, Business and merchants associations, Chartered accounts, Advocates, Insurance agents, Marketing professionals and executives, Small business firms, Service providers, Families, Individuals etc. ICM has two type delivery plans, Yearly Licensing and Lifetime Licensing. Yearly renewal brings regular income to ICM dealers, and keeps the revenue strategies fulfilled on annual basis. ICM offer an opportunity to earn tussl free commission on sale of those who referred by you. You can refer any dealer from your area who you feel will do business with ICM. ICM provides adequate helps in promoting the products. It ensures promotional materials like broachers, posters and presentations to run the campaign and marketing activities. ICM gives online training and coaching programs to the dealers and its staff to ensure the product knowledge and communication activities. ICM provides required technology updates and upgrades on timely basis to keep the software up to date. 01. What will be the investment? 02. Who will be the customers and where we can sell it? 03. How to offer customer service? 04. What will be the renewal commission? 05. Will we get promotional materials? 06. How our staff will get trained? 07. How often product will upgrade? 08. How customization works out? 09. How we can purchase the products? 10. What is the minimum purchase volume? 11. How the product is activated? 12. What is the ROI? 13. How we will refer a dealer? 14. What is renewal commission? What will be the investment? No investment is required to obtain ICM dealership. You can start with the existing infrastructure. Who will be the customers and where we can sell it? 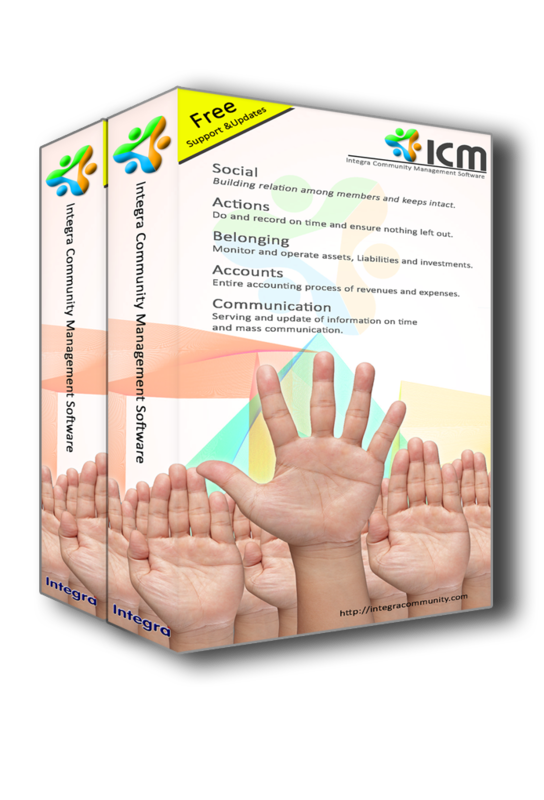 ICM software finds customers anywhere as it is applicable to different activates of various sections of societies. Some of the examples are as follow. Creates family tree, records family income and expenses, maintain family budget, tracks assets, investments, monthly payments and insurance, helps to build relations, occasional SMS and Emails, creates albums, digitalize important records, reminds important dates and many more….. Registration of members, collection of various fees, accounting, budgeting, asset management, communication, utility billing, reminder, bulk SMS and Emails, prints letters and envelops and many more…. How to offer customer service? Company provides online chatting, telephonic service to its ICM customers. New versions will automatically deliver to ICM customers on free of cost. As a dealer your duties are limited to marketing and installation. What will be the renewal commission? Those customer opts yearly licensing option has to renew the product license on or before expiration period. ICM dealer commission will be 55% of the renewal fee. Will we get promotional materials? ICM dealers will get promotional material like products broachers, posters, presentations etc. How our staff will get trained? ICM offers online staff training materials, conducts webinars and individual training through screen sharing process. How often product will upgrade? Even though there is no time schedule for updates, ICM tries frequent release of new versions so that the product will remain upgraded with new features, free from errors and bugs. ICM is not offering individual customization. However the customers deserve the right to forward their suggestions and requirements which will be positively considered and will incorporate in future versions. How we can purchase the products? ICM dealers can purchase product keys online. We have multiple options to purchase ICM according to your budget. What is the minimum purchase volume? There is no restriction on volume purchase. You can start selling by purchase starter pack of two keys and you will get 43% ROI. How the product is activated? After ICM installation user can register the product and avail the activation key online. ICM offer fantastic schemes and share maximum profit on your investments ranging from 43% to 300%. How we will refer a dealer? Referring a dealer is a simple process. You can refer any number of dealers those who possibly take dealership of ICM by just sharing the contact details. You can refer any person or firm from your industry or from any other filed. We will keep the source as confidential and will get the commission on every purchase. Your referral commission will be 3% of every purchase made by the referred dealer. Century Gate Software Solutions Pvt.Ltd. Head Office:- Pazhoor Arcade, Patturaikal, Thrissur. © Century Gate Software Solutions Pvt. Ltd.